As Samantha MacBride notes, modern waste–that is, postindustrial waste and particularly waste developed after 1945 when consumerism came into full swing in the United States– is synthetic, unpredictable, and heterogenous. Additionally, it has unique spatial and temporal characteristics compared to its predecessors. First, longevity: I’ve written elsewhere about the staggering longevity of plastics; the thousand to million year cycles of nuclear waste are well known; Persistent Organic Pollutants (POPs) are classified in part for their lack of half-lives and last even longer than nuclear waste; superfund sites and brown fields have depressing longevity; the list goes on. Many modern wastes exist in geological time, rather than evolutionary time, and certainly longer that it takes a piece of paper to dissolve in the rain. Then, there’s the geography of modern waste: the global networks of outsourcing goods and trash are well documented, and particular attention has been paid to electronic waste; another classification requirement of POPs are their ability to travel long distances; plastics accumulate in oceans, and plasticizers are on Mars, off-gassed from NASA exploration machinery; space debris is a relatively new, and probably permanent, field in discard studies; we can measure the age of Arctic and Antarctic ice based on particles deposited via nuclear fall out from the 1940s and Cold War. 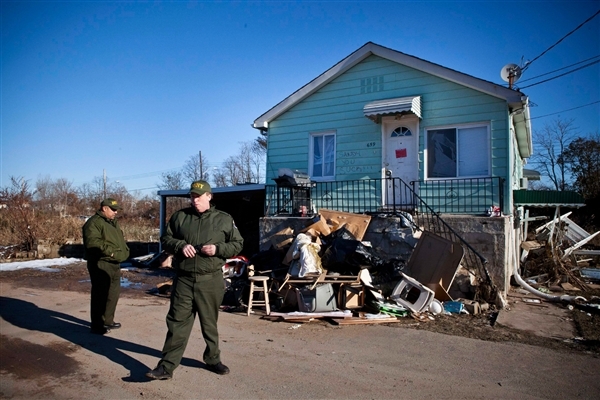 Department of Sanitation Workers survey the Midland Beach neighborhood where many homes are set to be demolished due to Hurricane Sandy in Staten Island, New York November 9, 2012. Photo from NBC News. I’ve been thinking about the space/time of modern waste, and particularly plastics, for some time now. It was only after a discussion with Robin Nagle about our city’s recent and ongoing problems brought about by Hurricane Sandy that I thought about “disaster trash” as a form of modern waste. Disaster trash is simply the trash that happens as a result of a disaster. In the case of hurricanes, it includes a lot of construction and demolition (C&D) waste, as well as immediate tonnages of spoiled food, disposable water and food containers, and probably human waste if enough infrastructure is affected. This was certainly the case for Hurricane Sandy. Several emergency dumps were created, many still in use, the most famous of which is at Jacob Riis Park in the Rockaways. Huge piles of debris at Jacob Riis Park in the Rockaways await transfer to the Fresh Kills landfill and then upstate. Photo from the New York Times. While some of the content of disaster trash is the aforementioned plastic, e-waste, and chemicals like POPs, much of it isn’t. Much of it is drywall and concrete. But some of it is photo albums, favorite furniture, books, and heirlooms The unique space/time aspect of disaster trash is that a whole lot of it happens all at once, and its appearance exceeds waste infrastructures. Disaster trash is the result of large-scale wrecking. 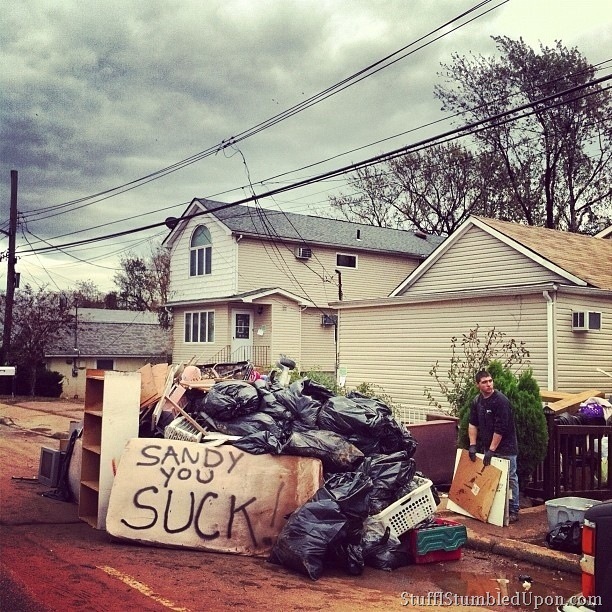 Hurricane Sandy presented, and continues to present, similar problems that 9-11 did for New York City in terms of disaster trash. Where do we put all this debris? How do we get it there? What is the nature of it? Should we sort it? Can we sort it? What kind of sorting do we prioritize? Where does it go next? How do we best attend to the social aspects of this special waste? It is full of things that are precious, dangerous, and unknown; things that are usually not wate. And here is this heterogenous mass, all at once, in dire need of space and attention. While there has been extreme weather since the beginning of time, and human-made disasters since there were humans, I calling disaster trash a modern kind of waste, lumping it in with nuclear waste and plastics. There are two reasons I consider diaster trash a modern kind of waste. First, due to urbanization, a trend that has increased steadily since the 1850s in North America, the built environment yields much more trash in cities than rural or sparsly populated areas and strains infrastructure on unprecedented scales. Urbanization and the density of the built environment is one of the spatial aspects of modern disaster trash, a condition of how so much trash can happen in one place at one time. The second reason speaks of a more recent and unfolding modernity we are confronting for the first time. Climate change and the extreme weather events it entails is going to make diaster trash more common and more extensive than before. Will hurricane disaster trash differ greatly in terms of its compressed space and time from flash fire diaster trash? Decertification trash from flood trash? Unfortunately, we will have the opportunity to find out. Finally, the space/time of disaster trash does not end with its sudden, massive appearance after a disaster. It lingers, it spreads out, it circulates. The debris from the Japanese Tsunami in 2011 has been washing up on western Canadian shores for several months and will continue to do so. The link from Canadian Shoreline Cleanup implies that this redistribution of waste may constitute a second disaster. 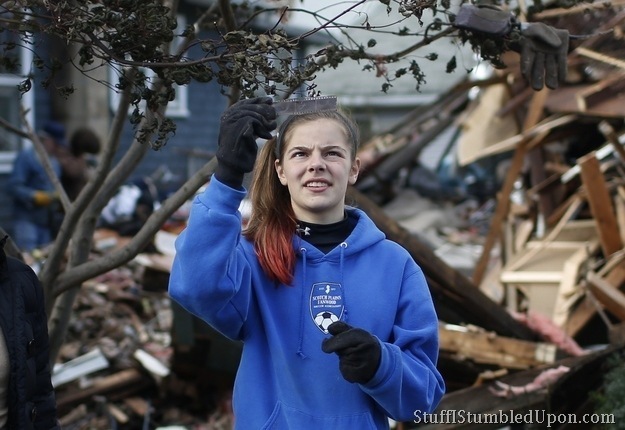 While I feel I can generalize, haphazardly and blog-ishly, about the compressed space/time of diaster debris, I cannot think of how diaster trash might generally circulate after the disaster has passed. Perhaps it cannot be generalized, but only catalogued. 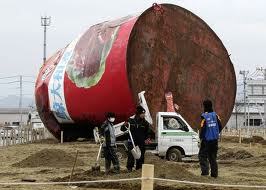 In Japan, a group of artists have petitioned to keep a giant commercial fish oil tank where it landed after the tsunami as an in-place, in-time memorial. 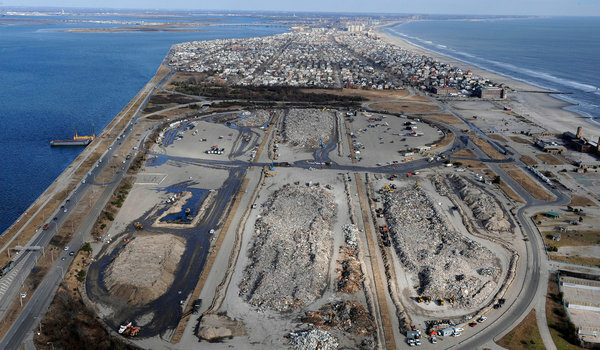 Parts of demolished houses in the Rockaways, New York, will likely become part of the planned wetlands buffer where homes used to be, buried as part of a hope that future houses will not have to be buried. Other parts of Sandy’s waste will slip into New York’s regular sanitation grind, shipped off to Ohio and Connecticut megalandfills on the usual schedule, becoming less disastrous as they conform to to normal spaces and times of our waste infrastructure. The giant fish oil tank artists want to become a memorial. Photo from LA Times. 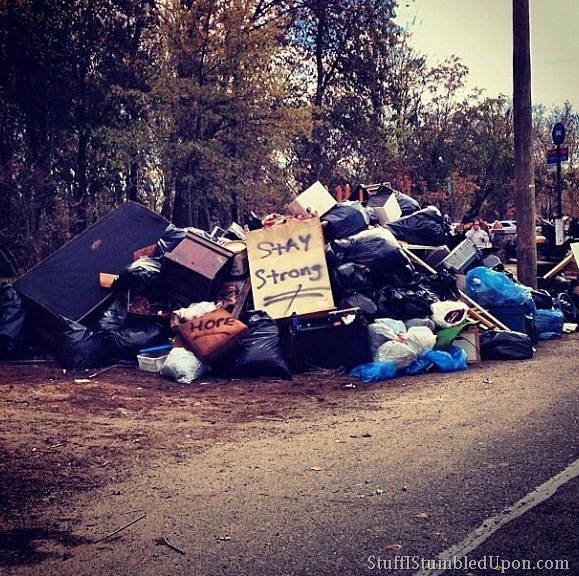 This entry was posted in Environment, Urban and tagged disaster, disaster debris, hurricane sandy, modern waste. Bookmark the permalink.